IMPRESSIONS of how the livery might look on its HST fleet have been released by ScotRail. 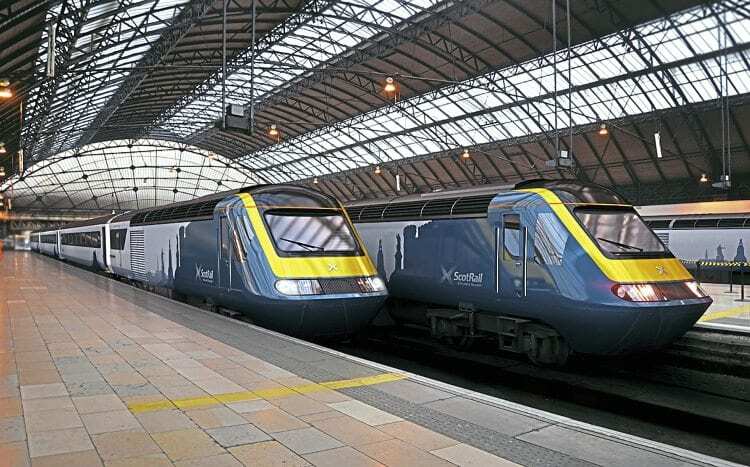 The majority of the ScotRail fleet is in the saltire livery, but the HSTs will be different with a pale grey bodyside and a silhouette of Scottish landmarks under the carriage windows. This attractive livery has been proposed for ScotRail’s HST fleet, and is subject to discussion and possible modification in the final version. The power cars have a more prominent depiction of the landmarks just behind the cab, with a partial rather than full yellow front end. Black roofs and a saltire cross on the cab front will complete the revision. ScotRail spokesman Angus Duncan did stress that the designs were a concept and being used to generate internal discussion, and the final version might be different.